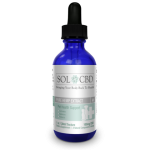 Use the coupon ALLCBD7 to get 7% Off on SOL CBD Products. Hey what’s up, it’s your friendly neighborhood CBD guy, Aaron here, with yet another product review. To those of you who are new to my site, let me tell you that I don’t sell CBD of my own; I test various brands and give you my unbiased views on their results. 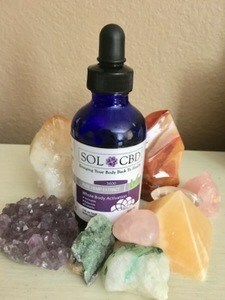 Today, I’m going to be doing Sol CBD Review, a brand that I only recently got acquainted with. I have been using CBD oil for quite a few years now and have successfully tested many products. One thing I found out (rather non-surprisingly) is that not all brands are same and not everything in the market will give you your dollars worth. So, being the good guy that I am, I took it upon myself to test out all types of products and bring you only the best of the best. So, does the brand Sol CBD make the cut in Aaron’s highly esteemed Best CBD book? Let’s find out. This company was started by a couple, Larry and Oksana Ostrovsky, both of whom claim to be natural health care advocates. They have been in the health and wellness industry for over eight years and run various personal development blogs to preach health awareness and improve people’s lives. The couple decided to get into the CBD business after experiencing its benefits themselves. They aim to banish the stigma associated with cannabis usage and bring people of a host of new opportunities to grow and improve. Do I personally believe this couple’s story? Yea, kind of. Would I ask you to try Sol CBD for yourself? I absolutely would! As far as CBD is concerned, this company does things differently than others. Apparently, the Ostrovsky couple figured out a way to boost the efficiency of CBD by blending it with Ayurvedic herbs. Now now, I know a lot of you aren’t believers of the Ayurveda medicinal practices of ancient India, but hear me out. I did my fair bit of research before buying my first product, but I have to admit that the claims this company makes are ludicrous. Sol CBD is sold in high concentrate tincture packs that deliver three times as much as usual dosages. These tinctures give you the benefits of full spectrum phytonutrients, vitamins and enzymes that help in treating a broad range of conditions. I found it quite easy to administer the dosages. The cinnamon flavor tasted exceptionally well for my liking, and I say this as a person who really doesn’t care about taste in CBD. Pretty sure the natural flavor would have tasted half decent at least. What’s my thought on Sol CBD Oil ? Even though my personal experience has been positive, I’ll have to admit that I had reservations about the product’s pricing. This brand is more expensive than the ones I usually try, so I did have to do some self-convincing before making the purchase. Its effect on my anxiety was good and left me made feeling calm and composed. The CBD did act quite rapidly on my anxiety symptoms, but not so much on back pain. Sure, I did feel a little more comfortable when on dosage rather than off it, but that’s about it. I’m sure you’d be content with its effects on keeping anxiety at bay. Overall, I’d say it worked pretty well. Non-American users have to wait though before they can get their hands on it because the company currently sells their products in the USA only (lucky me, huh?) CBD tinctures, however, are just the tip of the iceberg because there are many other exciting things to try. Next up, I tried it the vape oil variant of Sol CBD to see how that works. Just between you and me, I’m kind of addicted to vaping so I couldn’t let go of the opportunity to try out a new product. This oil is supposed to bring all the benefits of tinctures and let you enjoy the pleasures that come with vaping. As excited I was to try, I have to admit that the flavors didn’t strike me impressive initially. The grape/mint flavor felt kind of forced. But hey, that’s just my opinion. As far as its effects are concerned, I’ve only got positive things to say. You have to put this oil inside of a vaporizer and go on about doing your business. That’s how I like it! Vaping is not only more fun but gives you the chance to get even better results and faster as well. When you use a vaporizer, the CBD gets absorbed into the bloodstream almost instantaneously, bypassing the liver’s break down procedure. 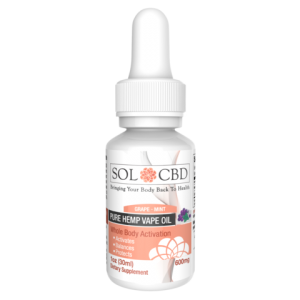 What are my thoughts on Sol CBD Vape Oil? I think it’s fabulous that this company recognizes that we vapers need love too. As far as the effects go, I’d say it’s on par with the tincture. Being a long time vaper, it takes me a little longer than normal to feel the effects, but I can say for sure that they come eventually. This stuff might surprise you, however, if you’re a first-time user. Vaping CBD is 100% safe and doesn’t get you high order leaves behind traces of THC (because there isn’t any). Try it out; it will help you keep your anxiety under control as it did with mine. Almost every other CBD brand has a topical solution for those who aren’t quite into ingesting the substance. 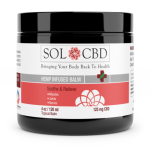 Sol CBD is no different as its herbal balm does fit in as a good alternative to tinctures and vape oil. Comprising of a synergistic mix of cannabidiol and herbs, this balm assures you quick relief from joint and muscle pain. Just rub the balm over affected areas and gently spread it out till it’s absorbed. Wait till you start noticing the changes. You have to apply this balm the same way you do with any other topical treatment balms. What are my thoughts on Sol CBD herbal balm? I must say that I’m very impressed with how this product turned out. As you can probably tell, topical treatments are mostly used for physical conditions. So, it would be wrong to expect this balm to have any effect on anxiety. My back pain, however, is a whole different story. The company says they use the world’s 12 most valuable herbal extract and oils – I believe them. Why? Because I’ve seen the balm working on my back pain from the minute I applied it. Yes, this is the power of CBD that so many people keep raving about. Hey, did I mention it made my skin smoother as well? Sol CBD Tincture for pets is intended to bring the same benefits that you get from the CBD to your… well, pets. Like I’ve already said before, I’m not a huge fan of experimenting with different products on my dog, Rufus. He’s a bit too sensitive, and even a slight change from his usual routine often causes trouble. So how did this CBD tincture fare for my ol’ four-legged buddy? We’ll find out, but first, let’s take a look at the product features. Since this item is created the same way as the one intended to be used by humans, you can use the dosages similarly on your pet. Either give them the dosages directly or mix the CBD in their favorite food/treat. It shouldn’t take long before you start seeing good results – that’s what the company says, anyway. What are my thoughts on CBD Tincture for pets? I would have given this product 5/5 if only it didn’t have the flavoring element common to this brand. But does that make CBD tincture for pets unusable? Of course not! My dog loved; it I am sure your’s will too. This wholesome extract doesn’t contain any isolates but is mixed with MCT to form the proprietary blend that makes Sol so unique. To be honest, I was quite anxious to see the results it has on my pupper, and I’m so glad that what I saw was only good. Yeah, guess this stuff gave me anxiety in a different way LOL. Rufus was his usual playful self and not once did it occur to me that I have to take him off the tinctures. As you know, I’m a huge fan of companies that offer no-question-asked money back guarantees. Sol provides the same, but it does have some terms and conditions that are worth discussing. Note that all purchases of Sol CBD offers a 60-day money back guarantee, no questions asked. However, the refund doesn’t include the cost of shipping and handling. So, you might want to think twice before applying for the refund. The good part is that you don’t have to go through the hassle of refunding the capsules if the package you bought contained less than 30. However, for packages containing more than 30 pills, you have to return the product unused. If you’ve got any more doubts, I suggest you carefully read the ToS on their website. Just visit the website www.solcbd.com, browse through their extensive collection of products, and choose the one you’d like to purchase. As a beginner, I’d advise you to buy only for yourself to see how things go. Payment options are Visa, MasterCard, Maestro, American Express, and Discover. Don’t forget to claim your coupon to receive a sweet discount. Sol CBD should appeal to beginners and connoisseurs alike because the company focuses on taste as much as it does on health. Word of caution though – don’t expect this stuff to work up an overnight miracle; you may have to continually take the dosages before you start seeing the desired results.